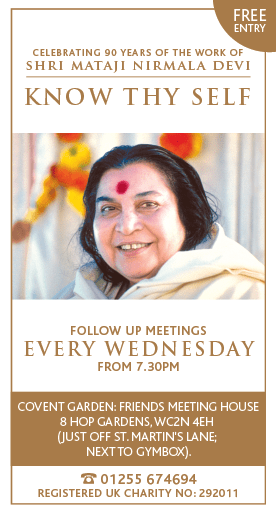 We are delighted to announce that there will be a free Public Programme at the Porchester Hall, Queensway, Bayswater, London, W2 5HS on the auspicious occasion of Shri Mataji’s 90th Birthday on Thursday 21st March 2013. This is the venue where Shri Mataji gave three free Public Programmes one in 1987 and two in 1989. This intention is expressed through a question and affirmation exercise each week at countless free Sahaja Yoga meetings across London, whereby those attending, experiment with truth, in invoking this principle within themselves. This principle of Guru resides in the Navel area, the area surrounding the third chakra. This is the principle which gives you balance, which gives you gravity. The gravity which connects us to Mother Earth is expressed through the Guru principle. Shri Mataji dedicated Her entire life to this one task, of inspiring and helping those that desired, to indeed become their own Guru, own teacher, own master. Thursday March 21st 2013, the day of the Spring Equinox marks the occasion of Shri Mataji’s incarnation back in 1923, ninety years ago. Shri Mataji took Her MahaSamadhi on February 23rd 2011 aged 87 years. Those that have received their own Self Realisation, as Kundalini Awakening is called, enjoy the state of ‘thoughtless awareness’ on a regular basis. It is the enjoyment of this state of pure meditation which inspires and nourishes Sahaja Yoga practitioners each day across the nations capital. Volunteers from the London area felt it would be joyful to mark this occasion by staging a large public programme and inviting their fellow Londoners to come along and experience this spontaneous yoga, called Sahaja Yoga, for themselves. The event will combine music and photographic slides, a brief introduction to the Life and Work of Shri Mataji, interview footage of Shri Mataji on tour and details of Her lifetime travels giving Self Realisation to all who desired it. Additionally there will be a short extract from the 1987 programme held in Porchester Hall, film clips of how the kundalini energy rises within the subtle system of seven chakras and opportunity to join in, workshop style and achieve Yoga via a Self Realisation exercise. This is then followed by a collective meditation whereby all shall hopefully experience a state of ‘thoughtless awareness’ and feel the ‘cool breeze’ on their hands and above the crown of their head! There will also be news about specific follow up opportunities following on from this event. Doors open at 6.30pm onwards for a 7.30pm start. The formal part of the programme will finish by 9.15-9.30pm whereafter music and slides will continue and there may be opportunity for informal mingling.